A quality connection starts with a quality cable. joyo instrument cables are affordable, pro-level cables that will have you making music on even the tightest of budgets! This 6-pack of 0.65ft patch cables offers a great value when multiple cables are needed. These right-angle 1/4" to right-angle 1/4" TS cables are color coded (yellow, red, green, blue, black and white) for easy channel identification. These cables can be used for recording studios, stage racks, keyboards, effects pedals, pedal-boards, P.A. equipment, instruments and more. Clean up and organize your setup with these great cables. 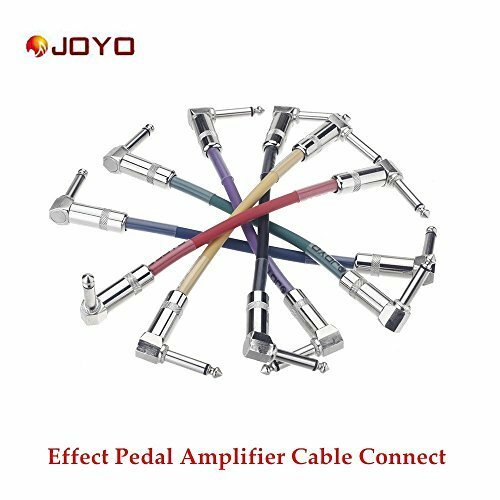 Joyo cables provide the ultimate in quality and value.A great cable for a great price.